The field proven TacticalPower® UPS line is ideally suited for military, industrial, computer and telecommunications applications requiring high mobility, reliability, rugged construction, compact size and light weight design. 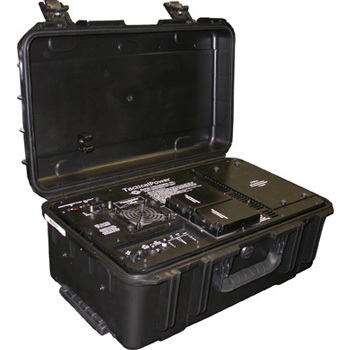 These units are equally suited for use in vehicular, field deployed, shipboard, airborne, or fixed locations with controlled or uncontrolled environments. 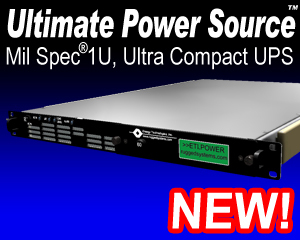 The ETI0019-2110 is specifically designed for lightweight global power deployment and/or interfacing with any of numerous ETI PDUs. The heavy-duty case occupies a minimum of space while delivering up to 1000 VA/750 Watts of clean, uninterruptible power. The rounded corners and rugged handles, aid in safe handling. Internally, all major components are well secured and electrically insulated to prevent damage due to shock and vibration. Designed to be portable, the unit can be used in a horizontal or vertical surface or even stored in a backpack. The provisions for both domestic (CONUS) and international (OCONUS) input voltages, and autoranging input voltage selection allows inputting any AC voltage from 85 to 270 VAC (i.e. nominal 100, 115, 120, 200, 220, 230 or 240 VAC sources) and any frequency from 45 to 70 (i.e. nominal 50 or 60 Hz sources) without special cables or having to open the UPS enclosure. Optional 12 or 24 VDC versions are also available. The high-reliability LED arrays keep the operator informed as to the unit's status including load and battery levels. All controls and protective devices are brought inside the case to prevent damage or accidental operation. The ETI0019-2110 can continue to operate as an electronic power conditioner and frequency converter even with it's battery drained, providing clean, well regulated, sinusoidal power to the load. The batteries are maintenance free with immobilized electrolyte and are constructed of flame retardant materials for added safety. A removable and washable intake air filters and high capacity stainless steel ball bearing fans provide added protection in both controlled and hostile environments. Maintaining documentation for equipment in the field has always been an issue. Instead of having to carry bulky paper documentation, the ETI0019-2110 incorporates the eDocs Port™, a patented feature unique to Energy Technologies, Inc. This flash drive contains all the relevant documentation for the unit at hand. This includes Operation and Maintenance manuals as well as training and troubleshooting guides. Utilizing a standard USB interface, these standardized electronic documents are readily available to the user. Overall, the TacticalPower line is uniquely qualified for critical vehicle, airborne, shipboard, or land based systems combining advanced modular design features with highly reliable construction.